Major County, Oklahoma, in the northwestern part of the state, in 1955 was the seat of six Mennonite churches with a total membership of 1,153, as follows: three General Conference Mennonite with 507 members: Saron in Orienta, six miles north of Fairview, New Hopedale in Meno, and West New Hopedale north of Ringwood; one Mennonite Brethren Church in Fairview with 411 members; one Church of God in Christ, Mennonite (Fairview), with 235 members. A small group, called the Penner Church, related to the Church of God in Christ, Mennonite, but independent, worshipped about six miles north of Fairview. Fairview is the county seat. 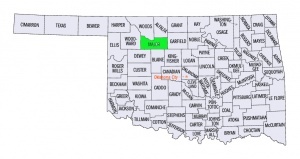 The Oklahoma Bible Academy was located in Meno in the northeast corner of the county. Schmidt, H. U. "Major County (Oklahoma, USA)." Global Anabaptist Mennonite Encyclopedia Online. 1957. Web. 21 Apr 2019. http://gameo.org/index.php?title=Major_County_(Oklahoma,_USA)&oldid=92551. Schmidt, H. U. (1957). Major County (Oklahoma, USA). Global Anabaptist Mennonite Encyclopedia Online. Retrieved 21 April 2019, from http://gameo.org/index.php?title=Major_County_(Oklahoma,_USA)&oldid=92551. Adapted by permission of Herald Press, Harrisonburg, Virginia, from Mennonite Encyclopedia, Vol. 3, p. 443. All rights reserved. This page was last modified on 23 August 2013, at 14:08.